Indus Motors Company has launched the second generation-Toyota Rush 2018 in Pakistan on 10th September. Powered by the 1.5-litre petrol engine, Toyota Rush is a 1500 cc mini-SUV. Back in 2010, it was used to be called the Daihatsu Terios but got renamed later by Toyota. During the following years, it has undergone several design changes. It will be available in Pakistan in three variants called G/MT, G/AT, and S/AT. S/AT being the higher-end one with the engine produces 136 nm torque and 104 bhp of horsepower. However, most of the internal features are the same between these three variants except the transmission options, some chrome ornaments, and other advanced techs. The seven seater car has a smart entry system and also comp able with i-Phone and Android. The car also has a tracking control system that makes it more secure. The car is available with a 4-Speed Automatic and 5-Speed Manual. The new Toyota Rush is designed with an exceptional submersion height of 60cm that allows the car to glide freely on every terrain with absolute ease. The Toyota Rush is available in the following colour options: Silver Mica Metallic, Dark Red Mica Metallic, Bronze Mica Metallic, Deep Maroon Mica, White, and Black Metallic. The S variant is the top-of-the-line variant. The price of Toyota Rush S A/T is priced at PKR 4,150,000. The price of Toyota Rush G A/T is PKR 3,765,000 and the price of Toyota Rush G M/T has been set to PKR 3,660,000. The booking starts and the delivery time is 45 days. In past, the Toyota model Daihatsu Terios lanched in 2010 but failed due to engine related issues also. 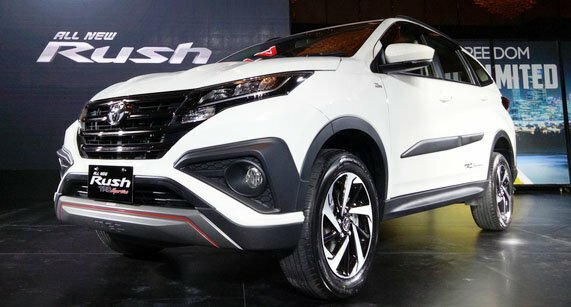 It is yet to be seen how Toyota Rush will perform in the Pakistani market.